Jackson Heights is a neighborhood in Queens, NY. 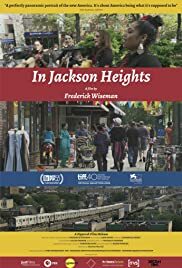 I decided to watch the documentary “In Jackson Heights”, produced by Frederick Wiseman, just because of its name (my being a native New Yorker), unaware of the underlying subject matter. This film presents Jackson Heights as extremely diverse and the residents are conflicted between the way things have been and what the future might bring to the neighborhood. Among the people profiled are Hispanic, Jewish, Muslim, LGBT, Italian, Irish, Black. The film shows people at work, people at leisure, groups discussing issues of interest to the neighborhood. There is no narration and no interviewer and no captioning (except for English subtitles when a foreign languages is spoken). That was hard to get used to, because I expect that in a documentary, but after a while it made sense just to have the residents do the talking. And this talking is often done in native languages. This adds to the feeling of diversity. Apparently the “gentrification” that has taken over Brooklyn and parts of Queens (closest to Manhattan) has not yet made significant inroads in this neighborhood. My favorite part of this film is at a meeting of the organization Make the Road to New York, where the leader of the meeting explains to the attendees what has happened to other neighborhoods, and how to prevent the same from happening in Jackson Heights. I learned something from that discussion. Keep the big chain stores out, because they will push out the local businesses, rents will rise, residents will not be able to afford to live there. I totally recommend this film to anyone interested on how a city neighborhood deals with everyday life. Watch the trailer (from YouTube). Have you seen this film? Let us know what you think. Please provide feedback or questions in the Comments. I would really enjoy hearing from you.